Christ appears to his disciples. (1-14) His discourse with Peter. (15-19) Christ's declaration concerning John. (20-24) The conclusion. (25)1-14 Christ makes himself known to his people, usually in his ordinances; but sometimes by his Spirit he visits them when employed in their business. It is good for the disciples of Christ to be together in common conversation, and common business. The hour for their entering upon action was not come. They would help to maintain themselves, and not be burdensome to any. Christ's time of making himself known to his people, is when they are most at a loss. He knows the temporal wants of his people, and has promised them not only grace sufficient, but food convenient. Divine Providence extends itself to things most minute, and those are happy who acknowledge God in all their ways. Those who are humble, diligent, and patient, though their labours may be crossed, shall be crowned; they sometimes live to see their affairs take a happy turn, after many struggles. And there is nothing lost by observing Christ's orders; it is casting the net on the right side of the ship. Jesus manifests himself to his people by doing that for them which none else can do, and things which they looked not for. He would take care that those who left all for him, should not want any good thing. And latter favours are to bring to mind former favours, that eaten bread may not be forgotten. He whom Jesus loved was the first that said, It is the Lord. John had cleaved most closely to his Master in his sufferings, and knew him soonest. Peter was the most zealous, and reached Christ the first. How variously God dispenses his gifts, and what difference there may be between some believers and others in the way of their honouring Christ, yet they all may be accepted of him! Others continue in the ship, drag the net, and bring the fish to shore, and such persons ought not to be blamed as worldly; for they, in their places, are as truly serving Christ as the others. The Lord Jesus had provision ready for them. We need not be curious in inquiring whence this came; but we may be comforted at Christ's care for his disciples. 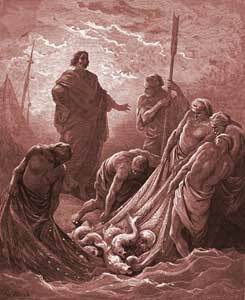 Although there were so many, and such great fishes, yet they lost none, nor damaged their net. The net of the gospel has enclosed multitudes, yet it is as strong as ever to bring souls to God. 15-19 Our Lord addressed Peter by his original name, as if he had forfeited that of Peter through his denying him. He now answered, Thou knowest that I love thee; but without professing to love Jesus more than others. We must not be surprised to have our sincerity called into question, when we ourselves have done that which makes it doubtful. Every remembrance of past sins, even pardoned sins, renews the sorrow of a true penitent. Conscious of integrity, Peter solemnly appealed to Christ, as knowing all things, even the secrets of his heart. It is well when our falls and mistakes make us more humble and watchful. The sincerity of our love to God must be brought to the test; and it behoves us to inquire with earnest, preserving prayer to the heart-searching God, to examine and prove us, whether we are able to stand this test. No one can be qualified to feed the sheep and lambs of Christ, who does not love the good Shepherd more than any earthly advantage or object. It is the great concern of every good man, whatever death he dies, to glorify God in it; for what is our chief end but this, to die to the Lord, at the word of the Lord? 20-24 Sufferings, pains, and death, will appear formidable even to the experienced Christian; but in the hope to glorify God, to leave a sinful world, and to be present with his Lord, he becomes ready to obey the Redeemer's call, and to follow Him through death to glory. It is the will of Christ that his disciples should mind their own duty, and not be curious about future events, either as to themselves or others. Many things we are apt to be anxious about, which are nothing to us. Other people's affairs are nothing to us, to intermeddle in; we must quietly work, and mind our own business. Many curious questions are put about the counsels of God, and the state of the unseen world, as to which we may say, What is this to us? And if we attend to the duty of following Christ, we shall find neither heart nor time to meddle with that which does not belong to us. How little are any unwritten traditions to be relied upon! Let the Scripture be its own interpreter, and explain itself; as it is, in a great measure, its own evidence, and proves itself, for it is light. See the easy setting right such mistakes by the word of Christ. Scripture language is the safest channel for Scripture truth; the words which the Holy Ghost teaches, #1Co 2:13|. Those who cannot agree in the same terms of art, and the application of them, may yet agree in the same Scripture terms, and to love one another. 25 Only a small part of the actions of Jesus had been written. But let us bless God for all that is in the Scriptures, and be thankful that there is so much in so small a space. Enough is recorded to direct our faith, and regulate our practice; more would have been unnecessary. Much of what is written is overlooked, much forgotten, and much made the matter of doubtful disputes. We may, however, look forward to the joy we shall receive in heaven, from a more complete knowledge of all Jesus did and said, as well as of the conduct of his providence and grace in his dealings with each of us. May this be our happiness. These are written that ye might believe that Jesus is the Christ, the Son of God; and that believing ye might have life through his name, ch. #20:31|. Interestingly enough, Jesus leaves us with plenty of information for the believer and pursuers to answer the questions of existence for themselves and equally to inquire among themselves. "There were together Simon Peter, and Thomas called Didymus, and Nathanael of Cana in Galilee, and the sons of Zebedee, and two other of his disciples." Some scholars maintain that NATHANAEL of Cana is the same as the disciple/apostle Bartholomew (Mark 3:18). I have enjoyed reading your comments throughout this forum as I continue to read God's Word. Thanks, keep up the good work. Mark; "just what is going on here? About knowing and not knowing???" That's a keen observation; and something hardly anyone seems to consider! But the matter of how and to whom the Lord reveals Himself; (even while He's standing right in front of them! ); speaks to 'how' and 'to whom' He finds us when He comes. Ordinary circumstances should not be despised; and we should KNOW that "It is the Lord." " the disciples didn't know that it was JESUS"" yet the disciple that Jesus loved told Simon Peter that it was the LORD" THEN THE DISCIPLES CAME TO SHORE AND DID NOT QUESTION HIM BECAUSE THEY KNEW IT WAS THE LORD"
just what is going on here? About knowing and not knowing??? John 21:12 Jesus saith unto them, Come and dine. And none of the disciples durst ask him, Who art thou? knowing that it was the Lord. One day we will have a glorified body like Jesus and be also able to eat fish. What Do You Think of John 21? After Jesus blessed the disciples' efforts, how many fish was Simon Peter able to catch?